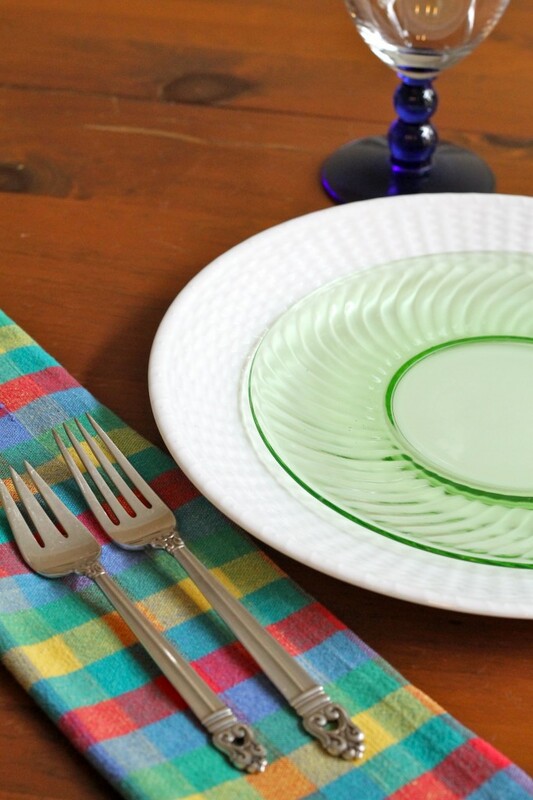 Are you familiar with depression glass? It is a clear or colored translucent glassware that was distributed free around the time of the Great Depression, according to Wikipedia. It was put in boxes of food like oatmeal and cereal as an incentive for people to buy the product. 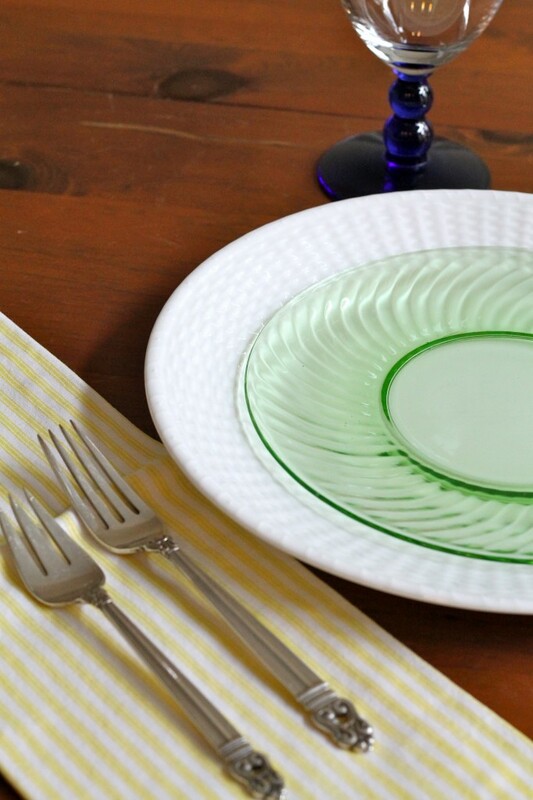 I have several sets of depression glass salad/dessert plates that have been so handy to own. The colors I have are blue, green, gold, blue, and purple. I also have a set of clear plates but am not sure they are “official” or not. 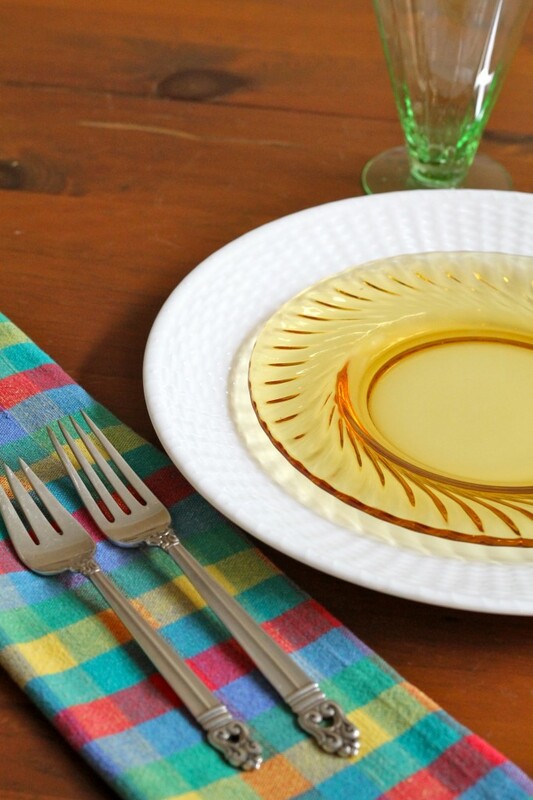 Depression glass comes in different patterns, and each pattern has its own name. There are major collectors out there, and some of the pieces can be quite pricey. I have it for strictly practical reasons. 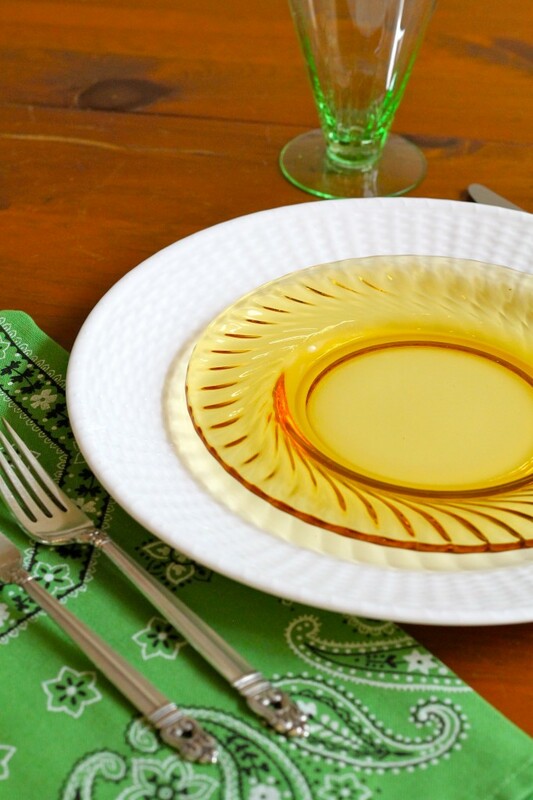 I love to set the table using different dishes, and the depression glass also comes in very handy when I serve heavy appetizers for a party. They are the perfect size for holding hors d’oevres. I own at least eight of each of the colors mentioned above and more in some of the colors. I thought it would be fun to show you how practical it is. 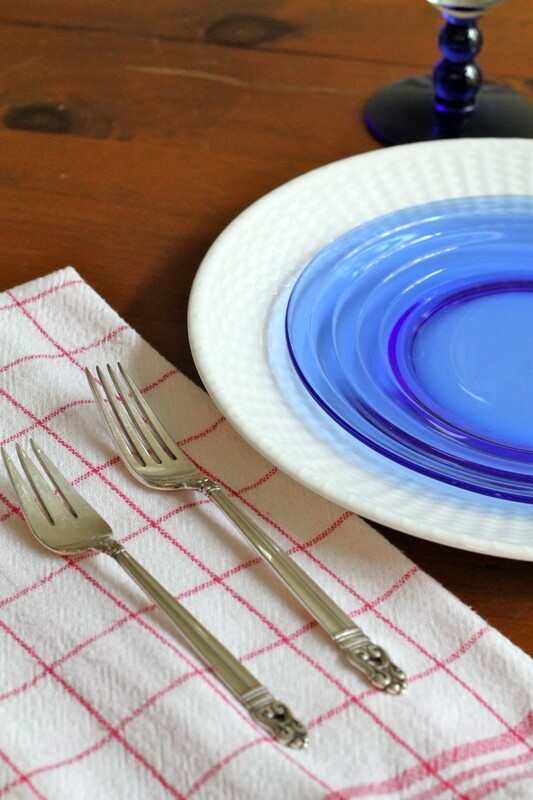 For this blog post, I am using the same white dinner plates (Nantucket by Wedgewood) and the same silver (Royal Danish by International), but I’m switching out the depression glass plates (and napkins) to show you how versatile it is. Also, I am switching out three different water glasses – one blue, one green, and one clear. 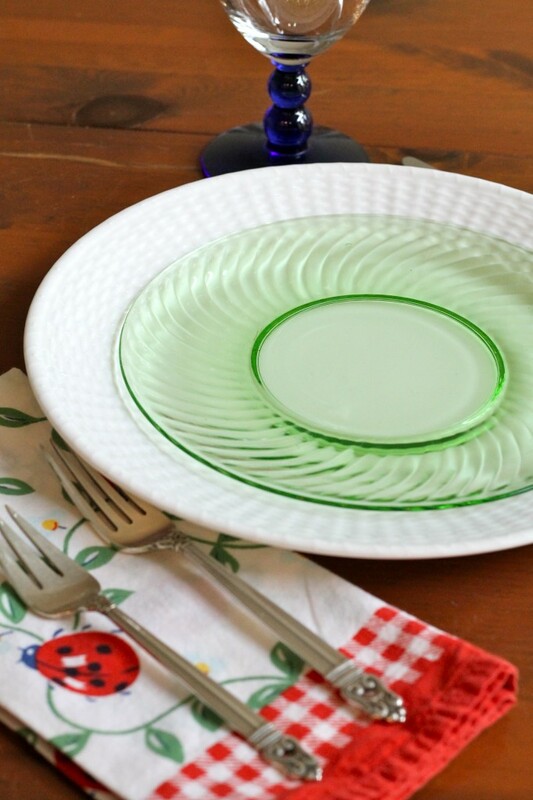 Let’s start with the green plates, the most practical, I think. 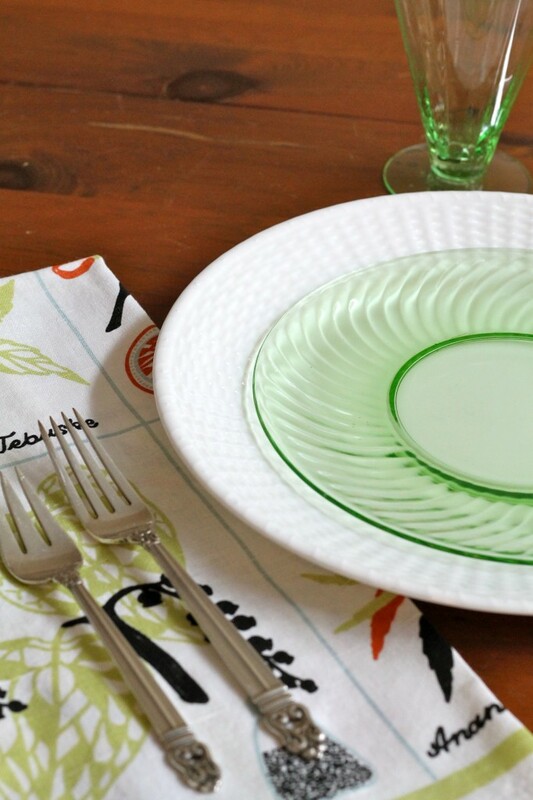 With pastel napkins, green works in the spring and summer. 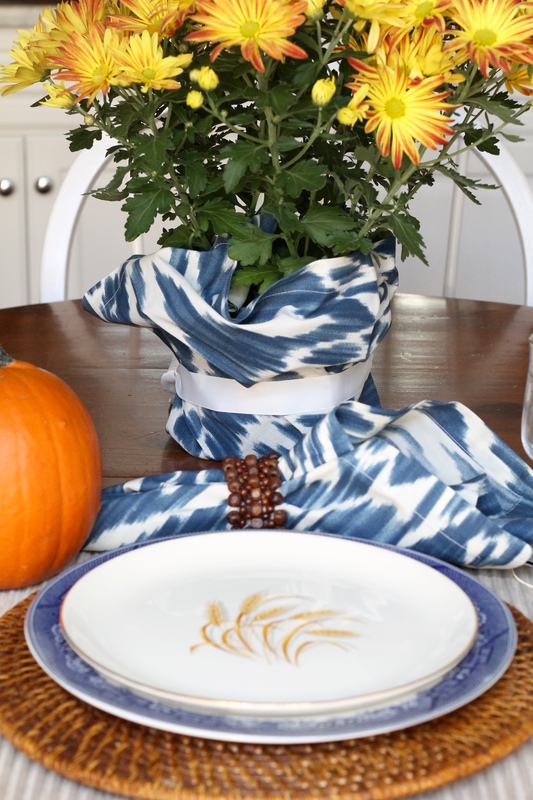 Add napkins that are fall colors, and it works in the fall. Then with some red winter napkins, and it works for the holidays. Here I changed just the napkin for a completely different summer look. I have a set of these napkins which are actually bandannas from Walmart purchased a few years ago. You can get a close look at the pattern here, but although my plates might be the same color, they are several different patterns. That’s okay in my book. 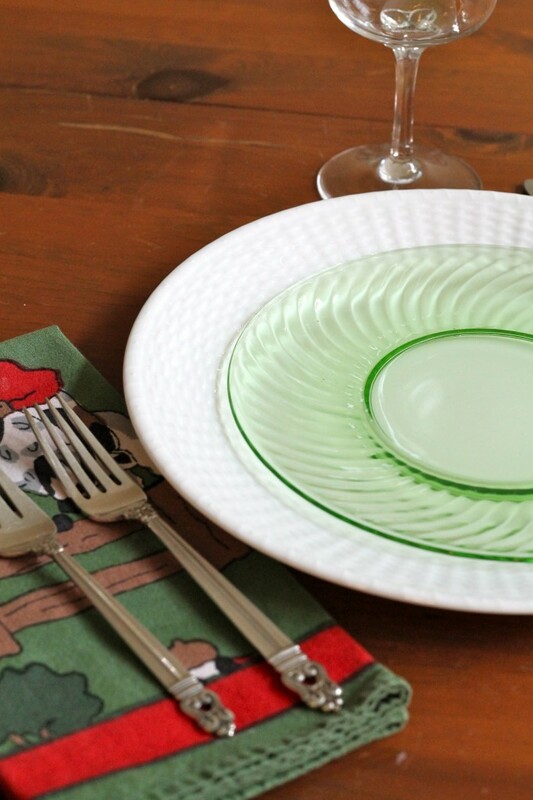 During Kentucky Derby season, I pair the green plates with my horse napkins. Do you see how this works? Finally, here is the same green plate again but with a napkin loaded with colors. Here’s another spring look. Most of my regular napkins are by Pommegranate. Their home base is here in Lexington, and twice a year they have a huge warehouse sale. In fact, it was just this past week-end, but I managed to stay away. For the fifth look using the green plates, I paired it with this dish towel turned napkin that my friend brought me from Norway. It’s another totally different look, but the plates haven’t changed. Now let’s move on to the blue. I think this pattern is called “Modern”. It is paired with a red and white French dish towel for Memorial Day and July 4th. I bought a set of these towels at a street market while bicycling in France. Here’s the same napkin that I used above. 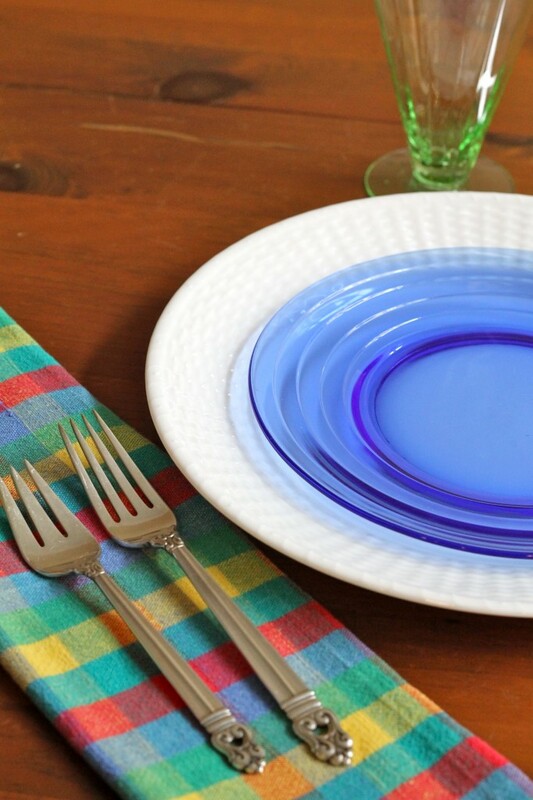 Having a set of depression glass salad plates in different colors is really very practical. 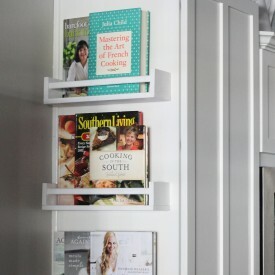 They take up just one shelf in my kitchen cabinets for storage, and they make a white plate go a long way. 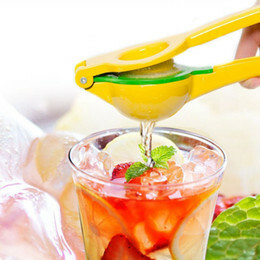 Also, they are perfect for everyday meals as well as for guests. The bandanna napkin works with both the green or the blue. This gold color is one of my favorites, but I use it the least. You can see that its pattern is the same as the green plate above, but I don’t have a clue what it is called. 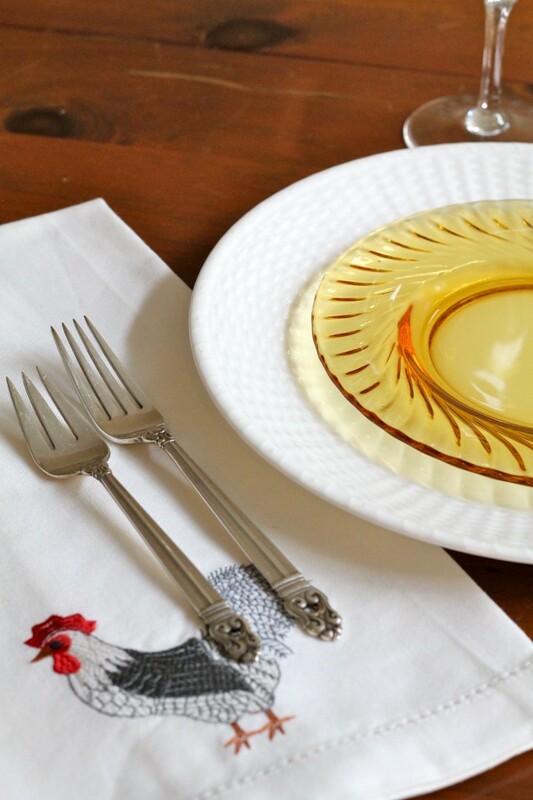 I like it with this chick dish towel/napkin because the little feet match the dish’s color. Plus, that rooster is so darn cute. I use the gold plates mostly in the fall, but you can see that with the right napkins, they could also work in any season. For some reason this napkin with the gold plate reminds me of Cinco de Mayo because of all of the colors. 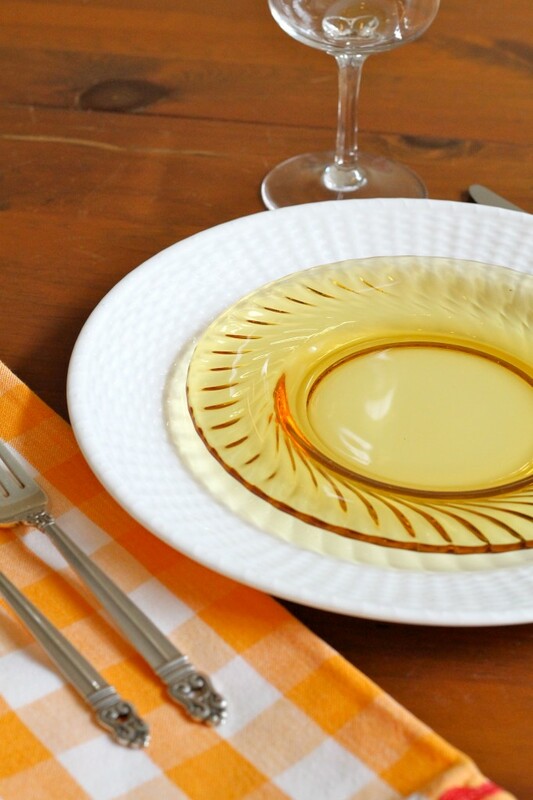 I love the gold plate with the orange and white checks for fall. This is my favorite look for the gold plates. This is a close second. 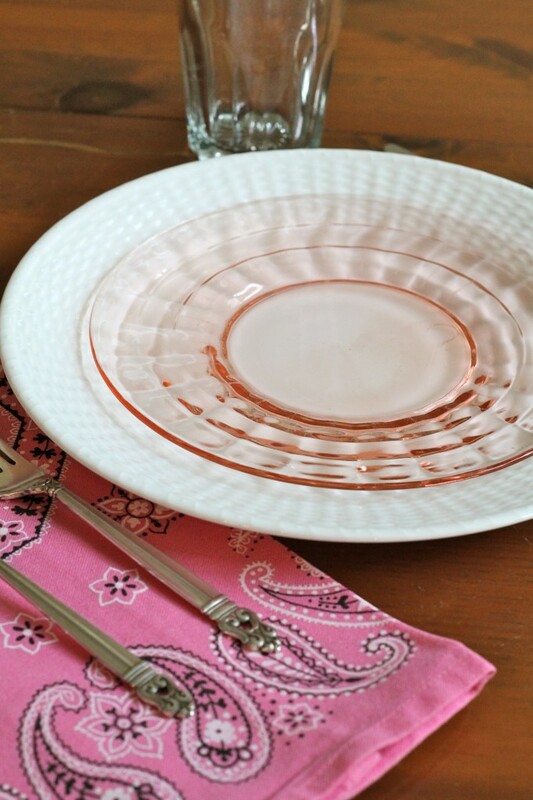 First of all, I love the bandanna dish towels/napkins that are from Martha Stewart several years ago. The napkin with the green goblet, which is also depression glass, is spot on. 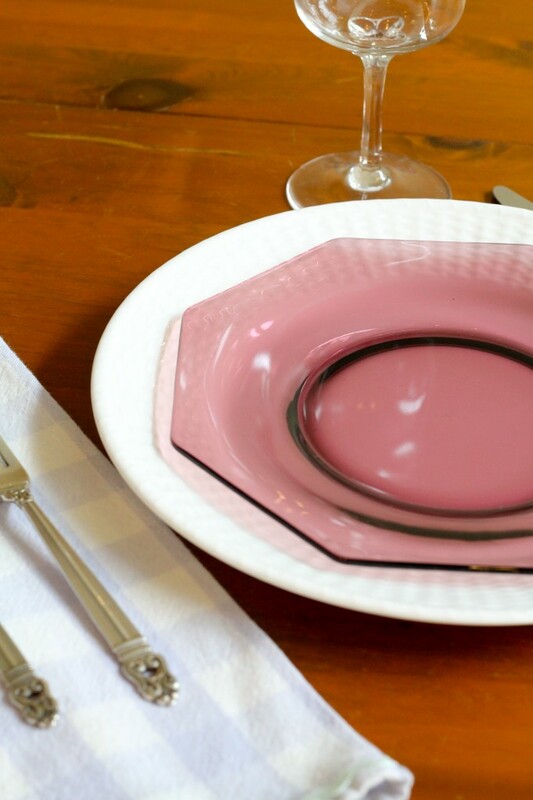 The pink plate is my favorite, but it just isn’t as versatile. 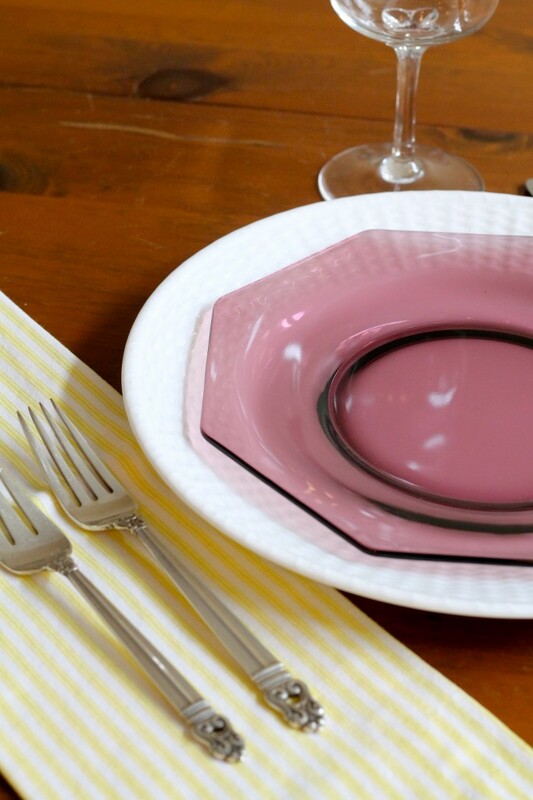 Paired with the same green dish towel/napkin, it looks preppy. It has a different pattern than the other colors I have shown you. Here it is very feminine. I wouldn’t use this look with Mr. Right. There’s too much pink for him. My mother bought most of these plates for me years ago. 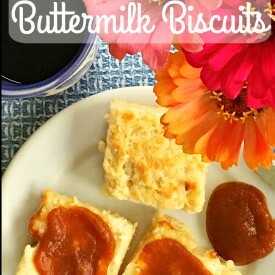 She found them at flea markets mostly and seldom payed more than one dollar per plate. When she felt as if I had enough of one color, she moved on to the next. It was a fun project for her. Purple was the last color she bought. I seldom use it because I just don’t do purple. These two shades of purple aren’t even close to matching, but I still use them together. In addition to the plates, I also have green dessert goblets and water goblets, and we have used them so much. 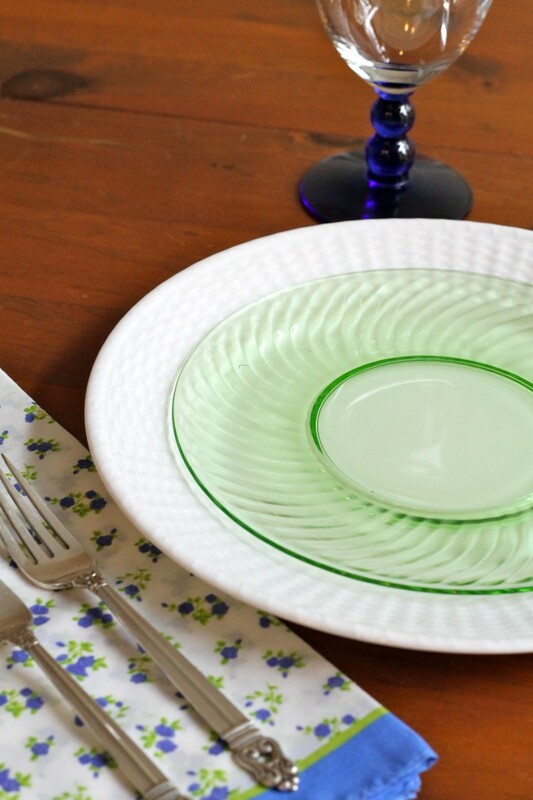 If you need a way to change out your everyday dishes or china, you might want to think about starting a set of depression glass salad/dessert plates. You will enjoy the hunt and enjoy using them. I hope that you and All of your Family have been doing well. I just Love your ideas about using Depressing era ware with all of the Lovely Napkins. You have done an Outstanding job of showing off each set. Drinking Glasses are hardly ever found, via Depression pieces….I have been hunting for more than half of my life to find sets, which I would Use, Love, and Enjoy!!!! 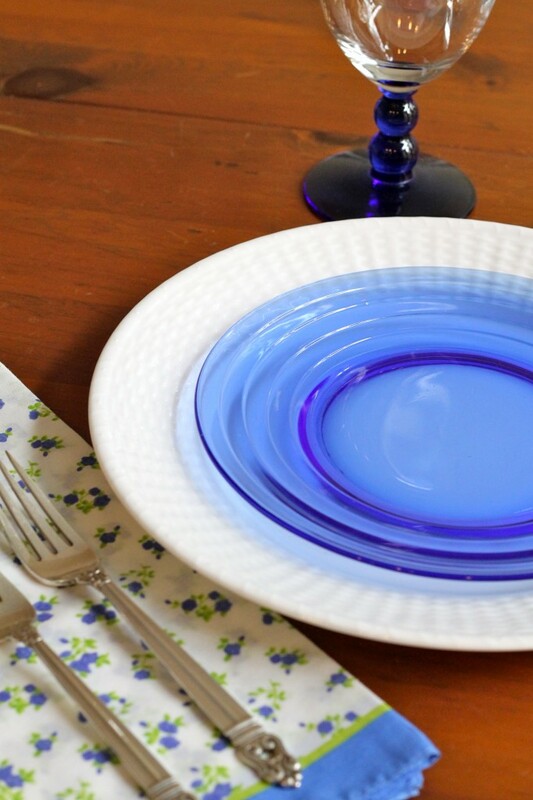 I am sorry, to post again….I meant to tell you that the Blue plates are worth a very small Fortune….If you wish to sell them, Please make sure that you get the money which they are worth!!! Oh, that’s good to know. I won’t be selling them, though. There’s too much sentimental value. Making a photo copy is a great idea. 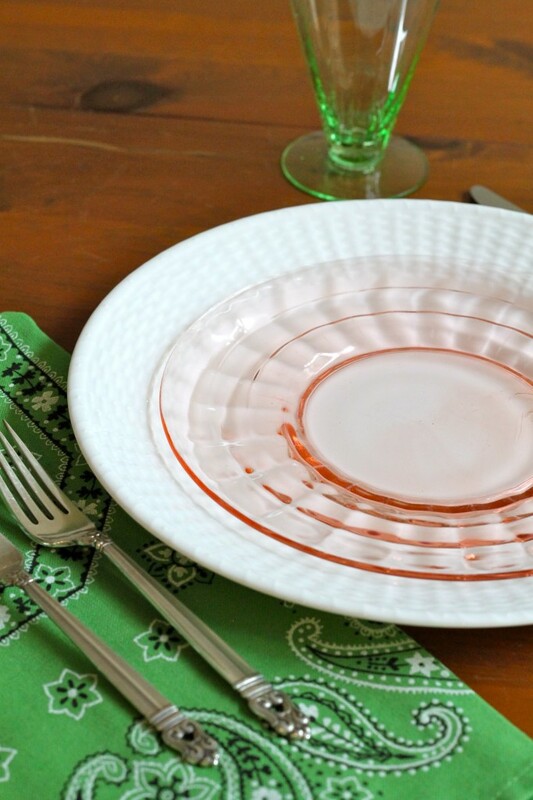 It’s funny that you wrote about Depression Glass today. I received a beautiful pink Depression Glass Bowl from my youngest son for Mother’s day and a book that gives prices. I’m sure his girlfriend helped him pick it out. I have a lot of Depression Glass and his girlfriend suggested I catalog what I have and mark the prices. I have 3 sons who don’t care for anything I collect and I worry they will just throw things out. I started collecting salt glazed crocks when I first got married (over 40 years ago) and one of my sons told me he was going to throw them out. When I showed him what they are worth, then he wanted them. I don’t think so. 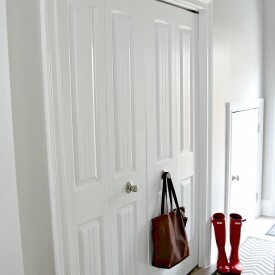 I’m convinced our kids will get rid of my stuff, too. I recently read an article that confirmed that. 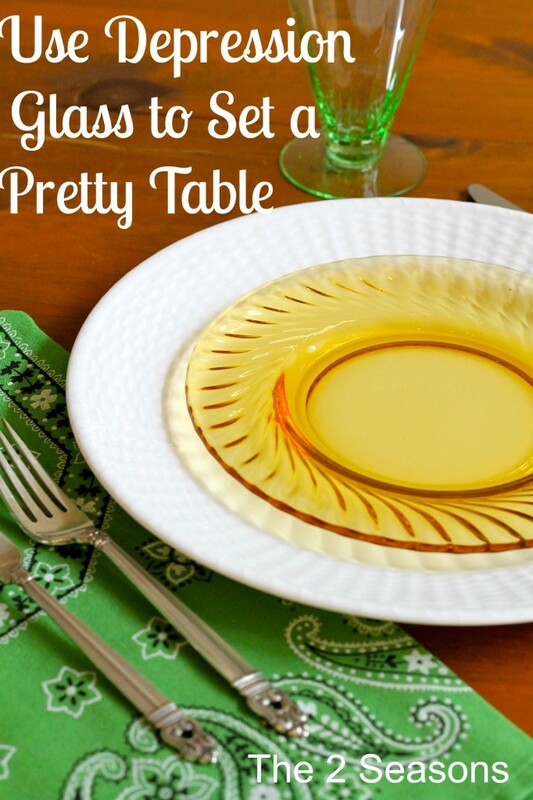 I have some depression glass and never thought to mix it with regular china…Loved each setting! !..So very beautiful. I went with my mom when she was on the hunt for her sets. She did enjoy collecting. 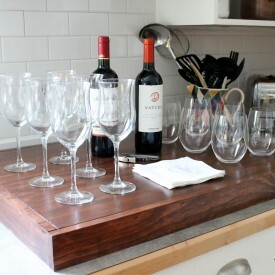 The cups and tumblers/stemware were more prone to breakage due to being picked up and set down. When mom passed I kept some sentimental pieces. For me the favorites are the tidbit servers with the handle in the middle or trays, cake plates, comports and other serving pieces. I use them often and they work by themselves for deserts or sandwiches, They also work to fill in other sets of dishes I already had. I was able to sell the others (over 500 pieces) to let others start or add to sets. My aunt bought a small set of crystal dishes as a wedding present for her daughter. The Gene Florence books are great for finding names and items made in a pattern and he covered many types of glassware. I got to meet him too at a glass show. Rick, thank you for the information. I will look at the Gene Florence books. We appreciate your comment.